At 14 years old, in the summer of 1990. I’ll admit, I considered that to be both the height of amusement, and moreover musical skill. That line actually comes from the last song on Johnny Crash’s “Neighbourhood Threat” record (the lead single “Hey Kid” was one that we buzzed off for months) but I mention it here because every time I’ve heard Snew I’ve always thought of JC. Since 2008, the Californian’s have done the whole, what we now have to call “sleaze rock” but was merely rock n roll when I was a lad, thing better than just about anyone else – and “You’ve Got Some Nerve” is another example of that. “UR Freaking Me Out” starts in raucous fashion (everything about Snew sounds raucous) but the horn section gives this the feel of something out of Aerosmith’s “Permanent Vacation” outtakes draw. In truth, nothing here is interested in being cutting edge (and why should it?). Instead, “Holy Hell” is like some turbo charged leather trouser wearing Chuck Berry take on rock n roll, “Acetylene Queen” has a bass rumble that sounds positively filthy – as well as sounding exactly like you’d imagine a song called “Acetylene Queen” to sound too. It will come as a surprise to no one involved in this that I’ll have to mention AC/DC at some point. Hell, all great rock music should have some AC/DC in it, shouldn’t it? And Vito doesn’t sound too dissimilar to Bon Scott at the best of times, but on “Put Upon” they whip up a storm that Angus and ….urmmm….Axl would be proud of. One of the best things about this collection is that it doesn’t have one of those ballads on. One of those ballads like “Never Say Goodbye” that when you first heard it you’d go “ewwww that’s the worst song on the album”, then some girl would go off with your mate and you’d all of a sudden think was about you. “….Nerve” ain’t interested in a ballad about Jayne, merely trying to find another Jayne to replace her, that’s why “Sharpie” sounds so full of beans and why the last solo from Andy Lux sounds so gleeful. “You Tell Me” is a little slower, and has a real swing about it – but there’s an undercurrent of something a little nefarious even here, while “Something New Everybody Wants” should be a Thunder song, it really should. But it isn’t. 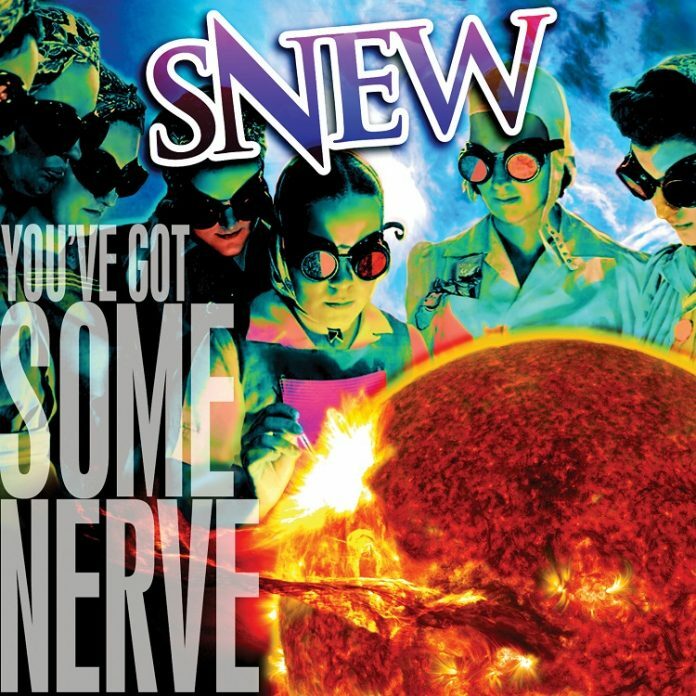 Snew got there first. “Revolution Is A Closed Loop” comes on like The Dead Daisies and is an arena rocker in waiting – and has to be given bonus points for getting the word “transmogrified” into a song with a straight face. And the title track is probably the best of all. Sweden’s Hard Rock kings Bonafide are surely casting envious glances in its direction – but like Snew they are so steeped in the music they’d probably love it to. That, really, is the point. This is a band that clearly loves the music it plays. There is nothing false here, just pure enjoyment. What’s Snew, pussycat? Nothing. But “You’ve got Some Nerve” is ace just the same.